I found those at Marshall’s a few months ago. They had just a few of them on the end of an aisle and I instantly knew they would work well for my gf mix or gf flours. I love the colors. You can submit corn starch for the potato and it works really well! Hi, I just purchased your book and love your recipes! The baking mix is exactly what I was looking for. I wanted to know which recipe you would recommend for plain biscuits. The sausage and cheese bites or strawberry biscuit bites? I see one has added fat. I would use the sausage and cheese one. I guess, I need to share my regular biscuit recipe on this site. I will add it to the list, but it is basically the sausage and cheese one without the extras. I hope you enjoy the ebook and the baking mix. Thanks for providing sooooo many recipes! I’ve just discovered your site and am eager to give gf baking a try. Which kind of rice flour is best in this recipe….brown or white….or are they interchangeable? Thanks again! I am glad you are enjoying the recipes. I plan to share more here on this site over the next few months. I have used both brown and white rice flour and both work. I usually use what I have or a combo of both. I hope that helps and I hope you enjoy the recipes. Hello Lynn! I have been gifted your wonderful cookbook and I am very excited to get to trying some recipes. I just mixed up the master baking mix and was looking for a plain (buttermilk?) biscuit recipe but I did not find one on your sites or in the book. I would LOVE it if you would post one. Thank you so much, I’ll be back to your sites often and this is the first of many posts, I’m sure! I am so glad you are enjoying the ebook. What a nice gift for someone to give. I love making gluten free easy and delicious and I love sharing it with others. I have had several ask for a basic biscuit recipe and need to get that posted here. I made them yesterday and took pictures so I hope to share it in the next day or two. So stay tuned for it. I’m allergic to corn & potato (as well as soy) and gluten intolerant. Do you think it would work to substitute arrowroot starch for the potato starch? Thanks! I have not used much arrowroot in baking, so I am not sure. If it usually works in other recipes, I would think it would in this. If you try it, I would love to hear how it turns out. Thank you for creating your GF Baking Mix. I made a recipe from a Youtube video using the GF Bisquick Baking Mix which is very expensive. It has no shortening included in the mix. 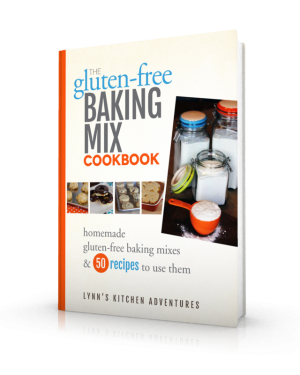 I will be able to make your mix without shortening to use with the recipes that use the Bisquick GF Mix and a separate mix for the recipes that use your baking mix with the shortening added. I also purchased your recipe book online. Thanks for keeping the price reasonable. BTW I only use Spectrum Shortening which is a healthy alternative to regular shortening. 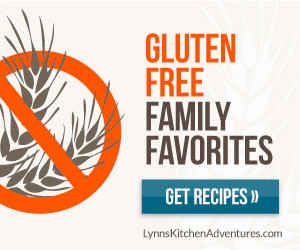 I am always looking for new recipes for my daughter who is gluten intolerant so she won’t go crazy for want of ”normal” snacks. Sorry that you had a problem. I will email the PDF to you to the email address you left with this comment. It will be coming from my lynnskitchenadventures email and I just sent it. Let me know if you still have problems. Thanks! Thanks. I was able to download the book to iBooks. Am so looking forward to the great recipes you offer. My granddaughter just recently was diagnosed with Celiac Disease, so I am being educated thanks to you!! I appreciate! Your gf flour mix sounds perfect! Oh, and thanks for the hints! I hope it helps with cooking for your granddaughter! 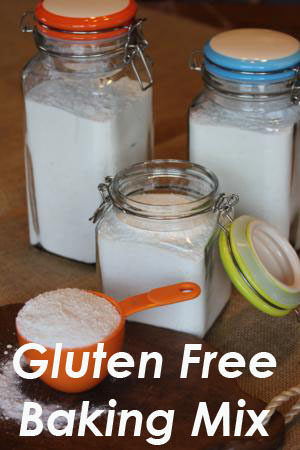 Gluten free can be challenging, especially in the beginning, but as you figure it out it gets easier. And when health issues improve and people feel better it makes it all so worth it! I cannot thank you enough! Found you on Pinterest. Yes, gluten free can be quite challenging. Especially when you purchase a book that uses fancy terms and fancy appliances i do not have. So much for that book! Lol. I am so excitedly I found your site, and I put your sites on my home screen so they r easily accessible. I am elderly and caring for a 15-year-old sweet, wonderfully girl who was diagnosed with Celiac. I will stick with your simple easy (and everybody’s says they are delicious!) recipes. Your sites is a lifesaver!! Thanks again. Would it work to make the mix with only the dry ingredients and cut in the fat needed for individual recipes? Yes, I think that would work fine as long as you figure out the right amount of fat for that same amount of flour mix. I hope that helps.